Since its creation, the European Union (EU) has been struggling to constitute a discernible coherent international actor. To this respect, a certain strand of literature has emerged focusing on the EU’s performance in various global settings. Looking at the EU performance in the UNGA, a recurrent issue of concern relates to its capability to achieve coherence and to become a consistent actor. 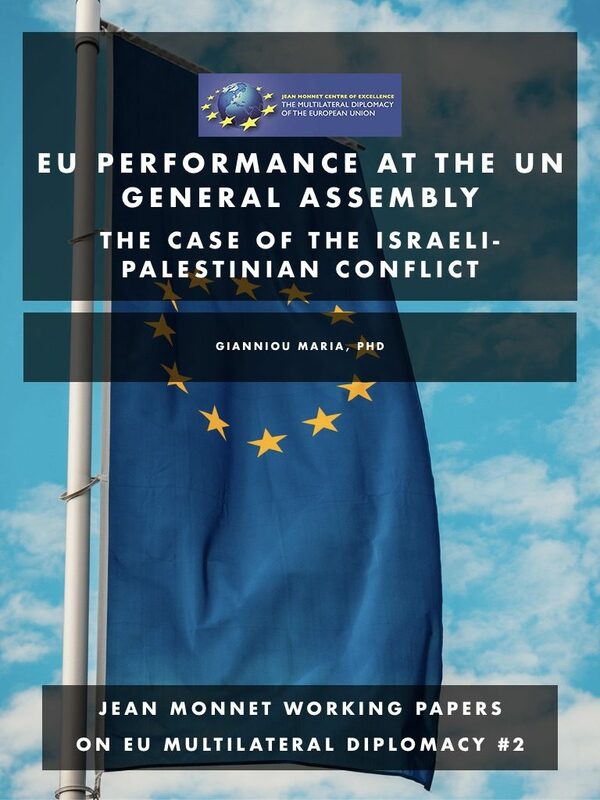 Our analysis aims at diagnosing whether the EU performs as a coherent actor in the UNGA vis-à-vis the Israeli-Palestinian conflict. Our research will, thus, add both to the literature on EU international performance and to the literature on EU relations with the East Mediterranean region. In order to do so, we will try to (a) demonstrate how the EU has managed to develop a certain set of principles over the years; (b) observe how it transfers the agreed position to the international level, in this case, the UNGA and (c) identify the limits of its coherent action via the examination of the EU reaction on two specific UNGA resolutions pertaining to the conflict, the first relating to the Goldstone Report; the second to the upgrade of the status of Palestine. We will, consequently, highlight the fact that even though, in general, the EU manages to be presented as a coherent diplomatic actor, with an agreed common position and voting cohesion, in particular, its performance depends on EU member states’ preferences and on how it reacts to external stimuli.